they were able to end poverty in their towns? that they bought their own cars one day? and only spend on what they needed? What if credit card debt wasn’t popular or normal? and have room to breathe each month? I dream big and then start small. Andy Stanley has done some of the best talks I’ve heard on money. It’s actually quite simple, but takes work and discipline. Series by Andy on this idea here and here. Many experts are passionate about families introducting these concepts early. 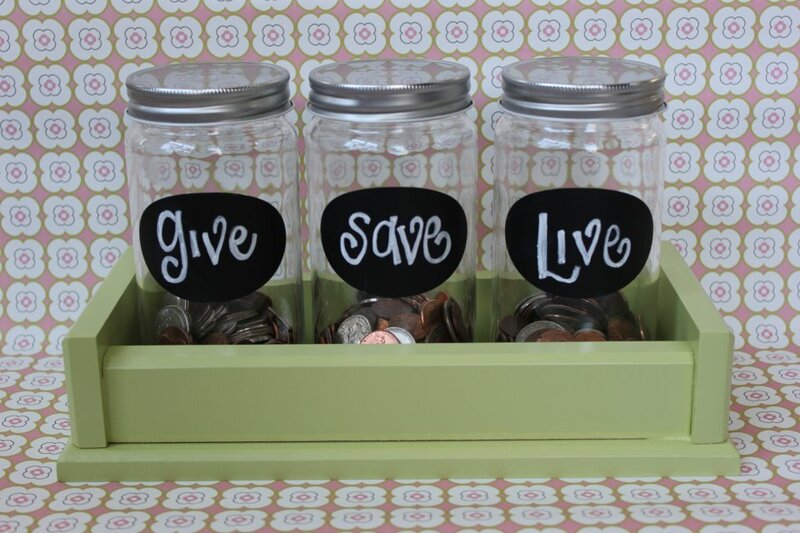 Ron Blue has a terrific book I’ve read and he actually endorsed the My Lil Money Jars when we launched. Dave Ramsey is a genius and has everything from products to books on the subject matter. Kay Wyma has a perfecto book called “Cleaning House” on the issue of youth entitlement. to meet the mom’s style and the child’s heart. these get the kids involved in their jars! 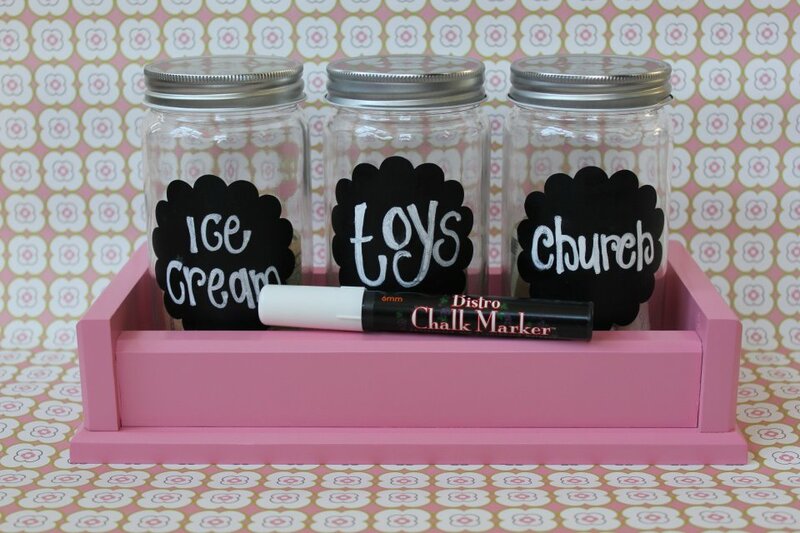 Those little cute chalkboard labels have power. When they are motivated – behavior changes. You want an American Girl doll? Let me help you save for it! You want a treat everytime we go into Target? 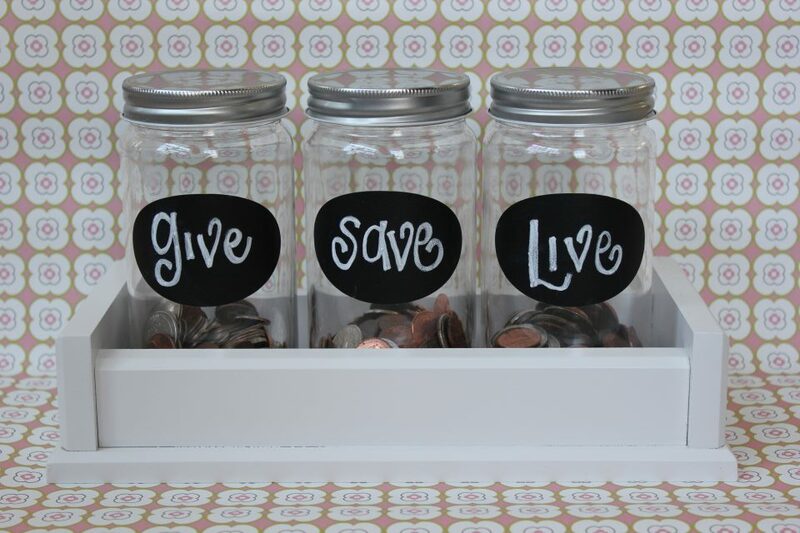 Awesome, grab one of your dollars from the money jar if you have any left! Aunt Sandy gave you cash for birthday? our church? a ministry you love? Getting them involved EARLY in the discussion helps it sinks deep. We launched these little jewels last year. 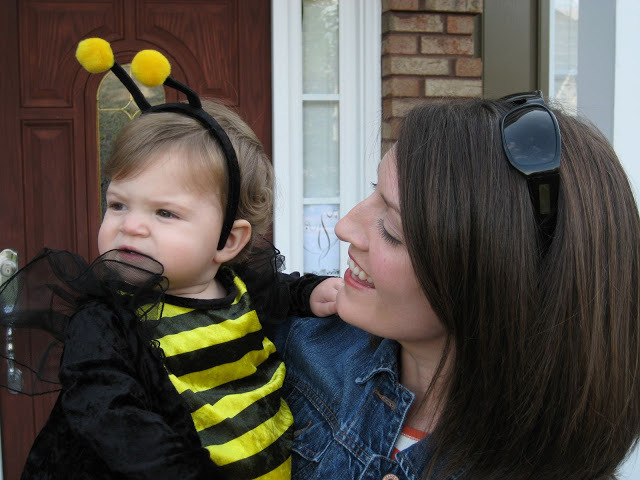 Moms loved the potential of teaching finances early to their kids. I sold hundreds and then, thank you Pinterest, TONS of you wanted to make them yourself. I am not sad. I am overwhelmed with much and happy to give it away! They are also now apart of Chapter 8 in In This House, We Will Giggle. My jars are from a wholesale place are not available to consumers. 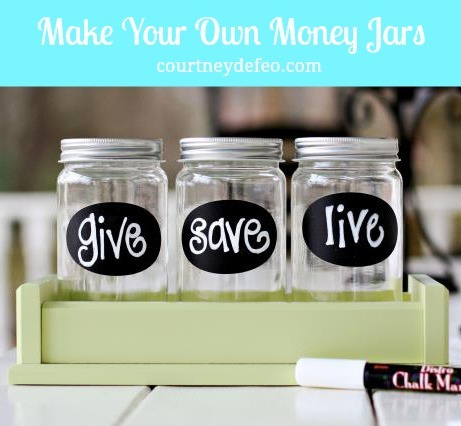 You can find so many jars out there from Hobby Lobby to JoAnn Fabrics to Michael’s and more. And I’ve just heard Target has them in the Dollar Spot! 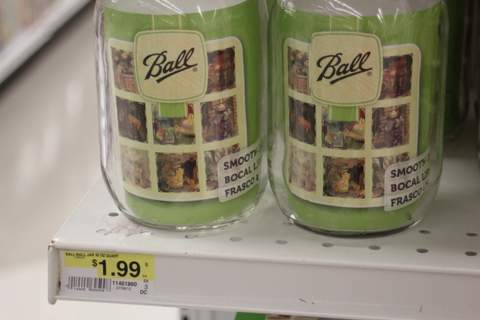 I would suggest SMOOTH jar without that traditional mason jar embellishment on the glass. I like ones with a silver top that is all one piece. The traditional canning jars have a disk that falls out of lid. Why glass? I feel kids old enough to chat about finances, are responsible enough to care for glass. However, a plastic set works the same and can look cute too! I used Jamie at Stickers Shop Unlimited for my labels and I love her. You can order any shape and size here. I heard these labels are also at Target now. My favorite one is the good ole “Bistro White Chalk Marker” 6mm by Uchida. 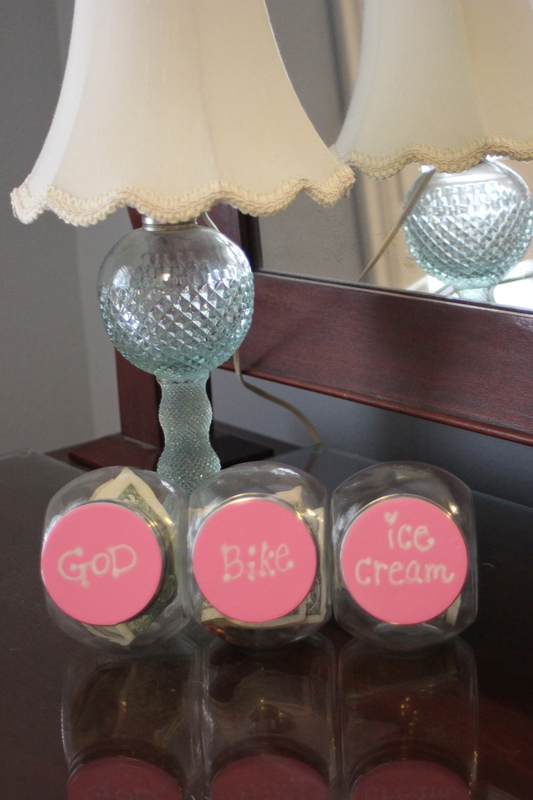 You can write so neat and kids just simple erase of chalkboard labels or vinyl from cricut with wet paper towel. I saw one in the bride section at Hobby Lobby – TOO expensive. Keep looking at art store or online. Michael’s has a set of “bistro markers” in a set of four with various colors. I had my trays handmade by a carpenter in Atlanta. I cannot find one “off the shelf” for you anywhere. 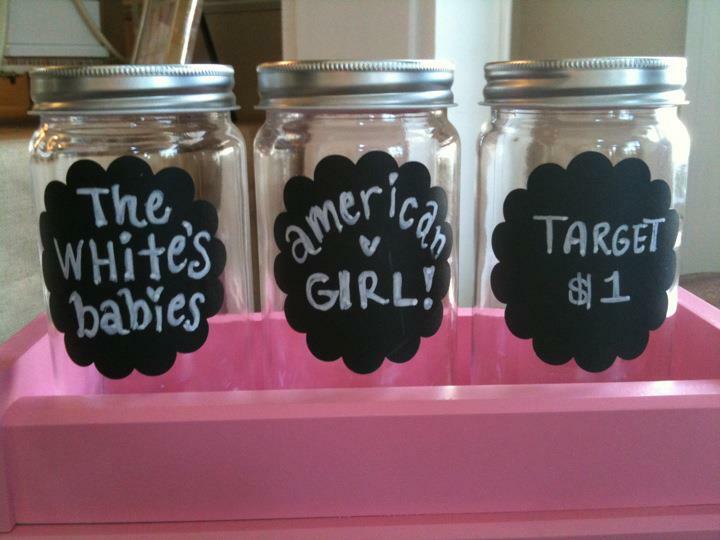 Plus, your jar sizes will vary. You’ll have to either forego the try idea or hunt locally. 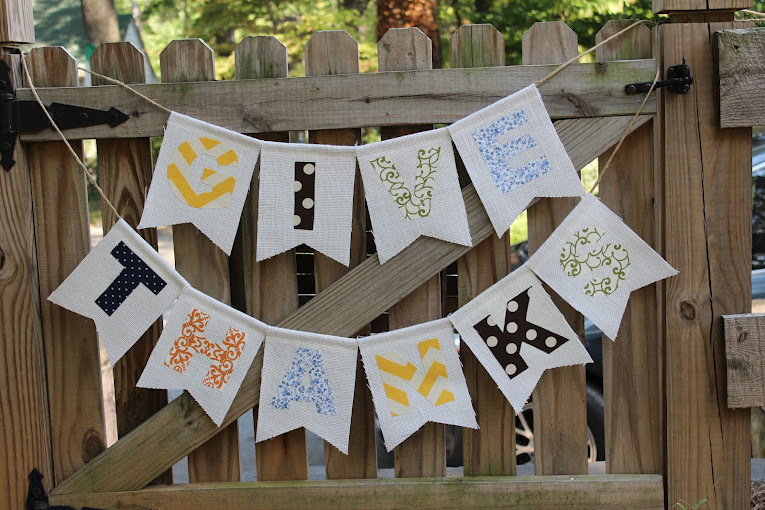 Or, those SUPER DIY people – get crafty at Home Depot and build your own. You can personalize with their name on a disc. Whew. Voila. Pass On. Share. You think you’ll try it? True confession. I’m a great giver and even better spender. 🙂 I am horrific at saving. Hooray for fiscally responsible husbands. I am praying that we will move forward with teaching things we need to learn. If you relate to me. Our kids can’t wait until we “conquered” finances to learn. Let’s grow with them. I also discovered many folks weren’t interested in this product because they didn’t see the need.